« The Euro Cup… thing. You know, with the ball. Facing my fears. (That was a dumb idea.) And spiders! I lived in Rye for the first eighteen years of my life, a mere mile or so from Playland Amusement Park. I haaaaaaaate amusement park rides because I feel no need, really, none whatsoever, to be exhilarated by speed, jarring movements, or the perception of imminent death. I was thinking the other day how amazing it was to come home to an air-conditioned room, strip down to your nethergarments, plop down on cool, clean sheets and watch something on cable. I felt like that was truly bliss. What is NOT truly bliss is to drive to a giant parking lot on a crazy-hot day, pay a bucketload of money, stand in long lines, and have a ride smack you around like you’re a battered wife. However, Playland has an iconic ride called the Dragon Coaster that has been there since 1929 and since I grew up in its large skeletal wooden shadow I felt I was somewhat obligated to ride it. Once. So this past Saturday Cricket and I went on down to Playland at noon, right when it opened for the day so the lines were short, bought a few individual rides, and got in line for the Dragon Coaster. We watched the people in front of us go on the ride while my heart pounded. Did I forget to mention that I did this without the assistance of any (doctor-prescribed or otherwise) anxiety-inhibiting drugs? I did it Civil-War-surgery-style, just bite down on this stick, rrrrrrrr. Then it was our turn. We got the last seats in the last car where Cricket gave me the comforting comment, “You can puke all you want, it’ll just go behind us!” And we were off. Here’s a video someone took so you too can live the dream. Here’s my feelings on it: The first big fall, I was fine. The first sharp turn, I was fine. Wheee! And then the ride actively tried to make me sick (up, down, up, down – at the :37 mark) which, frankly, hurt my feelings. Why, Dragon Coaster? We were having a nice time together, why did you have to try and make me barf? That was mean. Right after we exited the dark inside-the-dragon part and the ride tried to make me quease again, I turned to Cricket and said OKAY, I’M DONE NOW. DONE NOW. I’M DONE. Cricket realized we were on the threshold of me freakin’ the eff out, so he tried to be all soothing and whatnot and he said something akin to, “Great job honey, I’m very proud of you – but the ride isn’t over yet. See? More ride.” I continued with my loud, emphatic BUT I’M DONE. DONE NOW. I suppose I thought that if I kept repeating that phrase the ride would stop, grinding to a halt from the sheer power of my intense, bone-crushing desire to get off. Cricket kept having to say things like, “Look how low we are! We’re almost finished, honey! So very proud of you! etc.” The second we pulled into the disembarkation bay I changed my mantra to GET OUT RIGHT NOW. OUT. GET OUT. Cricket had to pull me out and, no exaggeration, my whole body was violently shaking so bad I could barely stand. 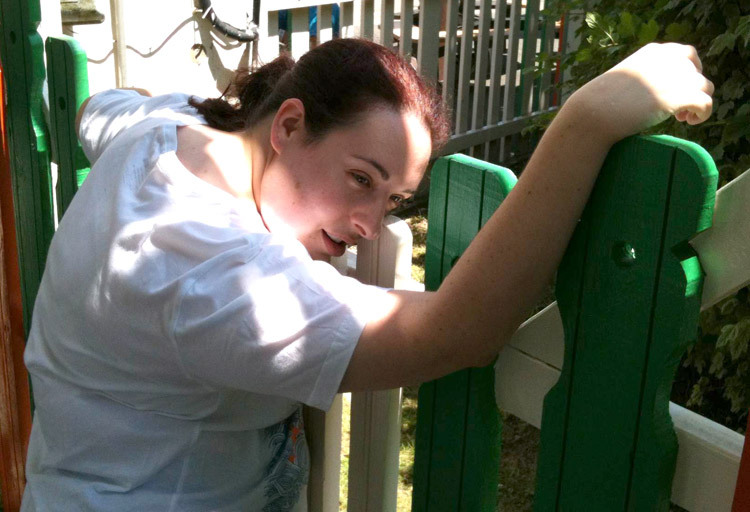 We left the ride area with me looking like a newborn foal and I promptly draped myself over a fence to die. Cricket took pictures. Please note I am wearing one of the only white t-shirts I own because I knew it would be in the 90s that day. There it is, like seeing the Loch Ness Monster. Jess in a white t-shirt. Enjoy. So I faced one of my fears. I’m thinking I don’t have to go on another amusement park ride for another 34-and-three-quarters years. Everyone okay with that? You know what I am not afraid of? Spiders! I was out of the country for the Super Bowl this year, so I missed all the commercials. When I returned, Snorth sent me this one which I adore and watch periodically just for funsies. Fantastic. Snorth pointed out to me that her favorite bug was the jumping spider that says, “Hello, lunch.” I informed her that I was unfamiliar with jumping spiders. And then the deluge began. Long story short: it has been four months since the Super Bowl, I now have a jumping spider as my background image on my phone, I belong to the Spider Fan Page on Facebook, and I’m already thinking about drawings I’m going to make incorporating jumping spiders in them. I also have a favorite group of jumping spider called the salticids. I like them bestest for a variety of reasons. One is that their heads are square-shaped and they appear to have eyeballs in all four corners. Another reason is the feather-duster-arms they use to clean all these eyeballs. But the primary reason I love them is because the males have big ole fangy-fangs that are iridescent and that totally resemble enormous buck teeth. Whenever I see one I automatically say “MIRFF!” with my front teeth pushed all the way forward because that’s what I think they would sound like. Here’s the picture on my phone. Here’s one of my favorite animated gifs. And here’s a sexay leggy mating dance. 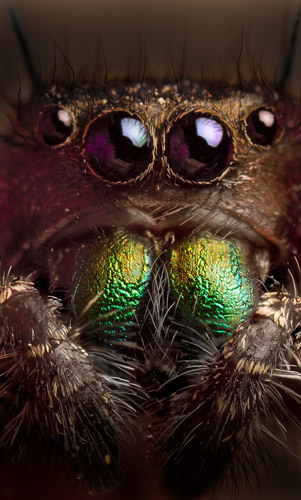 I highly recommend that you go to Google, type “jumping spider” in and hit Images. It’s like a treasure trove of tiny adorable little spiderypoo goodnesss. This entry was posted on Monday, July 2nd, 2012 at 8:53 pm and is filed under Beastiesbeastiesbeasties, My Art/Design/Business, Nature, New York, Stuff, Teh Intarwebz. You can follow any responses to this entry through the RSS 2.0 feed. You can leave a response, or trackback from your own site.